The Eagles Nest is a cozy bungalow to call home during your visit to Yellowstone Park. Located above the banks of the Yellowstone River minutes from the north entrance to the park, the house faces south looking into the park highlighting stunning views of 11,000 ft Electric Peak. You can literally look out the windows, or off the deck and see: elk, antelope, deer, and occasionally bears and wolves roaming the hillsides of Yellowstone. This rustic Montana log cabin is an inviting, cozy space it's is great for groups 4-6 with a fun loft for the kids! Enjoy grilling on the deck and stroll into town for ice cream, a cup of coffee, or some shopping. We are also happy to share our favorite tips for seeing Yellowstone and to help you plan and book activities during your stay! For larger groups, look at booking our neighboring cabins the Grizzly Den or Mountain King. All three make a perfect reunion spot! 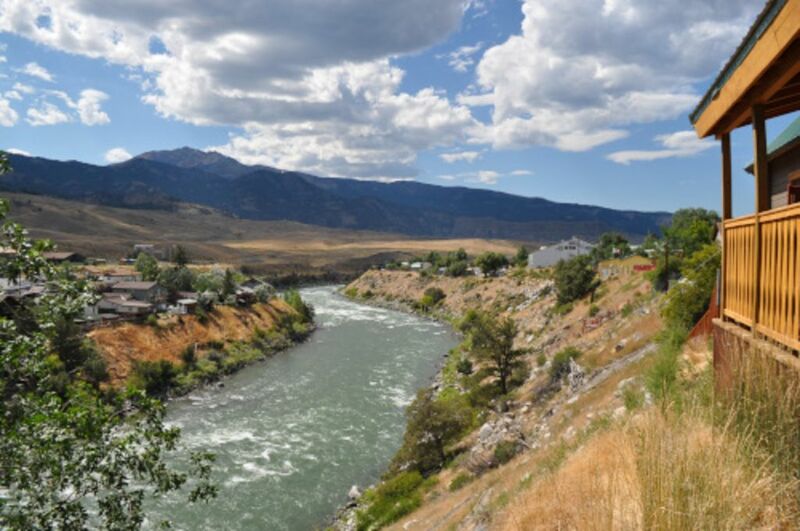 The Eagles Nest has private river access shared with the raft company for you fishing buffs. Descend the steep bank and drop your line in the water! My passions are my family, giving back to people and community, and play outside! We truly thank you for joining us! Fantastic views of electric peak, overlooking the river, and a bright little cheery cabin nestled into walking distance of all in Gardiner! It's hard to beat! Book the neighboring cabins for added space to accommodate large group gatherings! We can also line up park tours and massage for you! Walkable distance to all of Gardiner's shops and dining. Small town of 800 residents. We had such a short time so it was nice being so close and having a cozy, comfy place to enjoy the river and decompress. It was nice having our own rooms to retreat to and we slept so well. The cabin was cute, too. This was a great place to spend our last few days in Yellowstone. We loved the town of Gardiner and enjoyed the shops and restaurants. We also made it to the rodeo. This is a great little cabin for a quick visit. The view is amazing and the cabin was very clean. It wasn’t very big but who stays in the cabin the whole time when there is so much to explore. Great cozy cabin overlooking the Yellowstone River. Has all of the amenities. The cabin worked very well for my husband & I. There is a bedroom downstairs with a queen bed & the cabin also has a loft with a queen bed upstairs but it was only accessible by ladder. The bunk room downstairs provided a storage area for our luggage & clothes. The cabin would sleep 6 if it was a family with 2 adults & 4 kids. We did have my husband’s parents with us but they stayed in a local hotel since the loft was not accessible for them. Otherwise it was great! Location is good, the kitchen is fully stocked & we made several meals there. Owners are friendly & helpful. The laundry was an added bonus. A bit smaller than we expected but it was comfortable. Do not be misled by the nasty review. This little place was quaint, clean, stocked, safe. No, you can't go directly into the river...duh. But your little deck looks out over it. The history of Gardiner and its place in the beginnings of Yellowstone make this a perfect base. Its a small western town, so no, its not an environment like some upscale city or suburb. Keep in mind it does not have a subscribed tv service, so if you must watch something, bring something that you can hook into the hdmi tv. But hey, we actually enjoyed unplugging from all that fake news for four nights. Perfect location! Wendy stayed in touch at any time. Again, you have to experience Gardiner to understand, but we never, ever felt like it was unsafe or loud or rowdy. Loved it.